Mbaka described atiku as bureau de change, according to him, because of the foreign currencies that allegedly exchanged hands at the National Convention of the People's Democratic Party, PDP, before the ex-VP emerged the party's presidential candidate. Buhari in 2019 but warned him not to emulate Buhari ifhe is elected the president. "So let's go back to Nigeria." 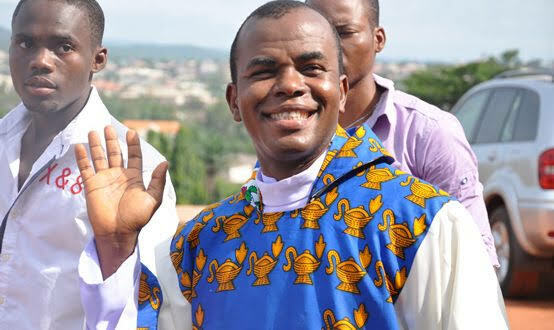 Mbaka said that Buhari had all the human and material resources at his disposal to make the country better, but rather chose to play ethnic, despotic politics. If you want to take it 20 Igbo men or 20 Yoruba men to change Nigeria; take all of them. Chukwuma) Soludo did in the Central Bank, he has assured Nigeria and the whole world that is nothing like bank collapse again. Buhari take Soludo for the economic revival of Nigeria's economy? Fulani herdsmen to Boko Haram to Jos killings. You said somebody stole, what did he steal? "Someday, they said they are giving N10,000 Small Businesses And I Want To Transform Nigeria? wants N10,000 start? They say Buhari is change, but Atiku is bureau de change Millions of dollars in Nigeria where hunger is killing people; where you do not have food to eat. They want to spend the money. "He lamented. Speaking further, the prophet describes the cost of interest and nomination forms as outrageous. According to him, if the leadership of the party had conscience, they would not have collected. "They said they were ready to kill anybody on their way," he said. "If anybody thinks that's the case" Atiku becomes the President of Nigeria, "Things will get better, who's born," because of this country "That said, Nigerians must do their part to make Nigeria the nation of their dream. We are people who want to develop this country in Nigeria. We have people who want to develop this nation. You were removed, you want to bring people that will fly you because you messed up the opportunities because you did not listen to the word of God. "The price of disobedience is disgrace," he declared.